This entertaining guide covers the period from 1485 to 1603, exploring the life and times of everyday people (from famine and the flu epidemic, to education, witchcraft and William Shakespeare) as well as the intrigues and scandals at court. Strap yourself in and get ready for a rollercoaster ride through the romantic and political liaisons of Henry VIII and Elizabeth I - and that's not all! Information on surviving Tudor buildings, such as Hampton Court, adds a contemporary twist for readers wanting to bring history to life by visiting these historic sites. Chapter 4: What was Henry like? Professor David Loades is Professor Emeritus at the University of Wales and has taught history at universities including St Andrews and Durham. He has written many books on the Tudor period and is a Fellow of the Royal Historical Society. Mei Trow is a history tutor, lecturer and author who has written numerous historical books on topics ranging from Jack the Ripper to Boudicca. His recent TV work includes Ancient Discoveries and Spartacus for The History Channel. Part I. Encountering the Early Tudors. Chapter 1. Touring the Time of the Tudors. Chapter 2. Starting a Dynasty: Henry VII. Part II. Handling Henry VIII. Chapter 3. Being Bluff King Hal: Henry VIII. Chapter 4. Running the Kingdom, Henry’s Way. Chapter 5. Six Weddings and Two Funerals: Henry VIII’s Wives and Girlfriends. Chapter 6. Building a New Church: Henry and Religion. Part III. Remembering the Forgotten Tudors: Edward VI and Mary. Chapter 7. Ruling from the Nursery: Edward VI and His Protectors. Chapter 9. Changing with the Times: Edward John, Jane and Mary. Chapter 10. Returning to the Old Faith: Mary I. Chapter 11. Ending the Dream: The Last of Mary. Part IV. Ending with Elizabeth. Chapter 12. Dancing with Elizabeth. Chapter 13. Choosing the Middle Way between Protestants and Catholics. Chapter 14. Gunning for Elizabeth. Chapter 15. Facing the Armada. Chapter 16. Ending an Era: 1590-1603. Part V. The Part of Tens. Chapter 17. Ten Top Tudor People. Chapter 18. 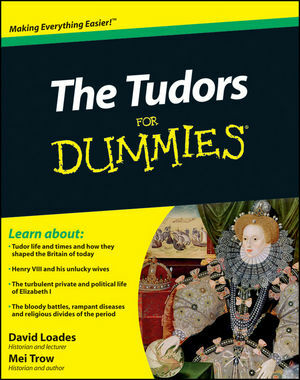 The Things the Tudors Did for Us. Chapter 19. Ten Top Tudor Buildings. Chapter 20. Ten Major Tudor Events. Chapter 21. Ten Tudor Firsts.